﻿ The worst intersection in Hudson is at the meeting of Columbia Street, Columbia Turnpike, and Prospect Street at the eastern end of the city, between Columbia Memorial Hospital and the cemetery. An agglomeration of acute and obtuse angles, grade changes, curves, and not-fully-expected stop signs contribute to a situation that one cannot negotiate logically or intuitively. I typically traverse the intersection in mild terror and complete it in amazement of not needing to detour into the hospital. The intersection as it exists is shown below. I fudged the building at 900 Columbia Street, which used to abut the sidewalk but was torn down last year. I've simply slid it back on the site to approximate the new building that now sits there. While many were lamenting the demolition of 900 Columbia Street last year, I wondered if it presented an opportunity to more favorably configure the intersection. While the basic street geometries can't be changed, perhaps, I thought, the removal of 900 Columbia would allow a traffic circle to organize the mess. I'm not generally a fan of traffic circles, but they are effective at taming complicated street geometries. And statistically they are the safest type of intersection by a wide margin: accidents are almost never bad, because everyone is moving in the same direction and contact tends to be low-speed and glancing. Compare that to the current intersection, where an easily missed stop sign can result in a driver getting T-boned by a car traveling at full speed. Below is the intersection with a traffic circle overlaid. My dimensions are crude, but it turns out that I didn't need to use the front yard of 900 Columbia. In fact, I kept the whole northern edge of Columbia Street intact. If a larger circle (ellipse?) is needed, space perhaps can be taken to the east, where the existing house has gained a much larger front yard, and to the southwest, where the existing hospital parking lot is inefficiently configured. The hilly topography is a concern, as a traffic circle needs to be level. Some significant regrading would be required, particularly at the south and east, where Prospect Avenue and Columbia Turnpike terminate. These roadways would have to be lowered, which would result in a steeper hillside at the edge of the cemetery. Another concern is that traffic circles often are ugly. 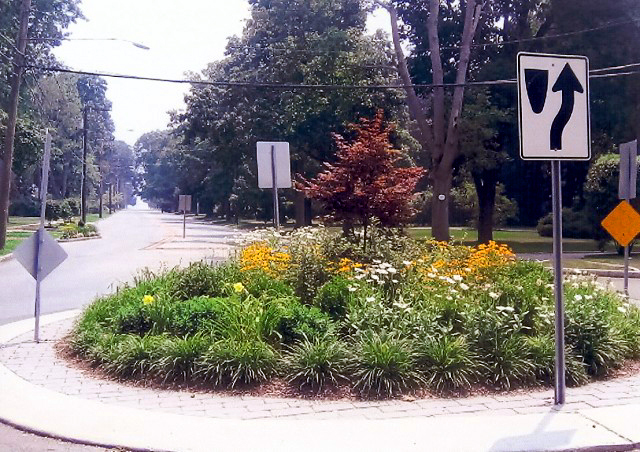 But when thoughtfully landscaped, they can be a community amenity that imparts not only safety, but a pleasing welcome for drivers and pedestrians. The one shown here isn't the most stunning example, but you get the idea. ﻿﻿If I were to sermonize briefly here, I would question the zero-sum view that historic preservationists too often take toward buildings and cities. In fighting the loss of old buildings, they often fail to engage the city as the creative enterprise it actually is. Their focus is on what might be lost, not on what might be gained. Of course, we didn't need to tear down the old building at 900 Columbia Street to consider improving the intersection on which it fronts. But the possibility (and ultimately the reality) of its loss is in fact what sparked the "what if...?" exploration here. To the rearward-facing historic preservationist, such exploration is not undertaken because a loss is unavoidably a loss. But to the creative person, losses are opportunities. When I took a break from blogging in early 2011, I didn't expect it to be for three or more years. Then again, I didn't foresee the reason for the hiatus: the startling and repeated nastiness I encountered in my first few months in Hudson. Had the bad behaviors come from random individuals on the street, I might have more easily moved on. But all of the actors, save one, hold or have held public office in Hudson; and the exception among them has been as prominent here as any of the others have been over the past decade. I have felt great shame for these individuals and for Hudson ever since. This is not an attitude I wanted to bring to this blog or carry with me when I walk down Warren Street. But the question of whether this little city is in some way poisoned nonetheless faces me daily. (I continue to live in Hudson.) I realize that this question is in many ways unfair, because I also have met many good, open-minded people here. But it does seem that public dialogue here is distorted by a handful of relatively privileged individuals with a very narrow view of cities, society, and Hudson. And they have little compunction about discrediting, misleading, insulting, shouting down, ignoring, fabricating conflicts with, or—I kid you not—making public faces of disgust at those with whom they disagree. The mistake I have made in response has been to try to rationally address these behaviors. Indeed, I have started this blog post many times over the past three years, each time leading with an effort to explain and address the foolishness that went on. But, I have realized, publicly calling out people on their manipulations and temper tantrums, no matter how egregious, tends to bring one down to the level of the offenders. And so without further explication (until, perhaps, the guilty parties next run for office), I hereby restart this blog. Its focus will be somewhat more expansive than before, as in addition to opining on Hudson urbanism, I will explore other cities and towns in the Hudson Valley—and, at times, beyond. Indeed, the world is larger than Hudson. is an architect, urban designer, and instructor of design and writing. He is the author of nine books, including 101 Things I Learned in Urban Design School. He is currently at work on a new book, Radical Urbanism.